There is one photo I never took, one of a scene far more beautiful than any I’ve ever seen to date . . . The breathtaking view was on a long drive on the northwest route toward Port Angeles in the state of Washington, U.S.A., as Day 5 of our 3-week Teardrop Trailer trip was nearing an end. We had been traveling North on coastal Route 101 since we left Oregon, but once we were about halfway up into the state of Washington, much to our dismay, Route 101 began wandering inland. When we hit the town of Artic, we had a decision to make. On this far northwest part of Washington State referred to as the Olympic Peninsula, Route 101 became a circular loop that traveled loosely along the west, north, and east edges of this tall rectangle land mass. Along the south edge were several highways and roads that collectively connected the west leg of 101 to the east leg of 101. Olympic National Park sat smack in the middle of the peninsula, surrounded by Olympic National Forest and tons of State Parks. Since our destination for the night was a campground just inside the north entrance of Olympic National Park, due north from Artic as the crow flies, we had to decide whether to head east out of Artic on Route 107 and make out way on various other highways and roads until we reached the east leg of Route 101 heading northward along the eastern side of Olympic National Park or to continue on Route 101 out of Artic and head northwest along the western side of Olympic National Park. Our GPS told us the preferred route would be the eastern one, promising to be picturesque due to an expansive lake region along the way. But because we ached to see Washington’s coastline, we ignored the GPS and headed for the western route, hoping to score views of the Pacific on the part of the road that ran north out of the town of Queets and continued for 12 miles directly on the coast before hitting Oil City. When we reached that stretch of road, water views were hard to come by. Trees separated us from the open views we were used to along California’s coastline, so we took a turn off the road and visited Kalaloch Beach 4. There, we parked the car and, with dog in tow, headed down a pine tree-lined trail to a driftwood walking bridge where a rocky beach opened up before us. Down the full length of the beach as far as the eye could see was a perfect line of pine tree soldiers, standing shoulder to shoulder, keeping watch over their fallen brethren that lay strewn along the coastline with their weathered, fair-skinned trunks and branches exposed to the elements. 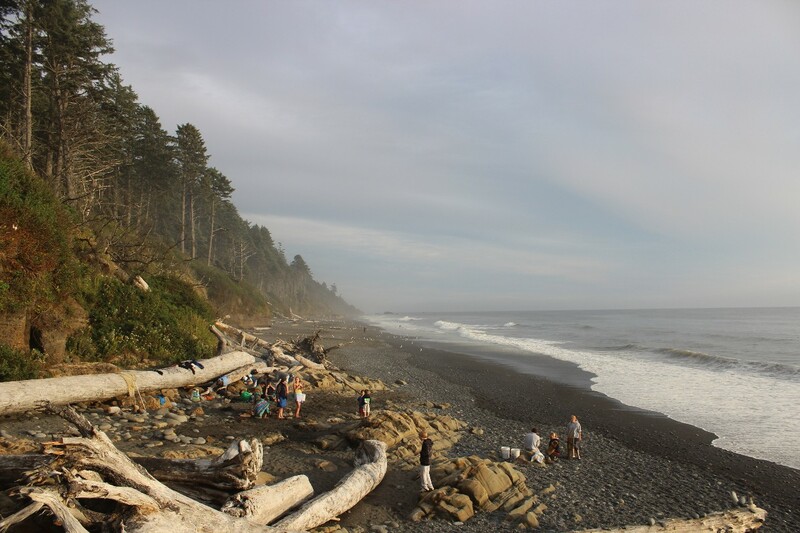 The marine layer fog that blocked our view of the Pacific on much of the coastal ride in Oregon and into Washington, too, finally dissipated at Kalaloch Beach. 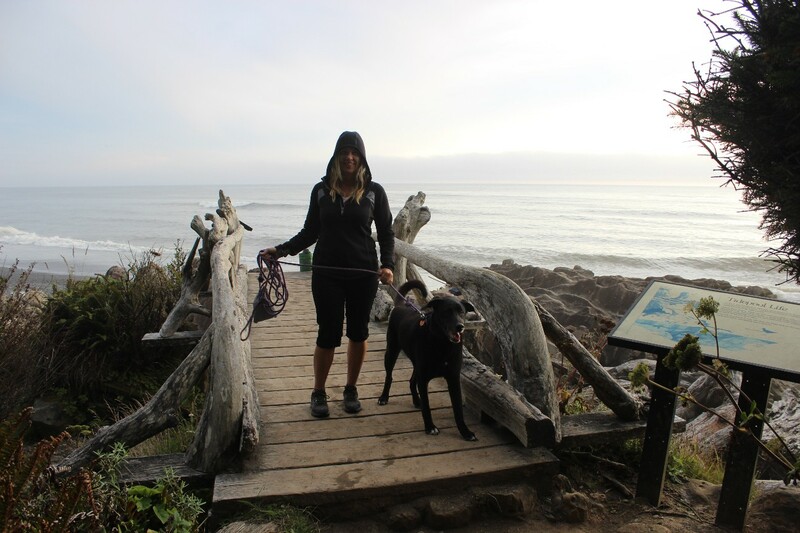 We were grateful for the lighter misty spray that met us there and enjoyed a long walk on the beach, taking in the sounds and smells of the Pacific Ocean. Afterwards, we made our way back onto Route 101 and continued on what was supposed to be a scenic part of the ride. We were in an area known as Olympic National Forest, and though the heavily forested area had its own beauty, we were still smarting from not having seen as much of the Oregon and Washington coastline as we hoped to. And we were tired—dead tired. The tall, uniform, untouchable forest trees that lined the highway quickly felt monotonous and had the effect of a slow hypnosis, making us sleepy . . . very sleepy. That is, until the road turned eastward to continue along what we thought was the northern coastline of Washington, along what we thought was the Strait of Juan de Fuca that separates the U.S. from Canada. After a while, the road narrowed considerably and took on a wiggly serpentine shape. Guardrails and steep hillsides bridled close by. The cloudy sky above deepened into a mystical blue-gray. We seemed alone on the road—alone except for the dreamy dusk that surrounded us. A snake-like lane of dark water appeared unannounced alongside our highway road, rising to a level equal with the road, taking on the road’s form as if it were part of it. I felt claustrophobic in its presence. I couldn’t tell where the black water ended and the black road began. Around every turn, I half-expected the road would be flooded. Beyond the water was an even deeper blackness, unidentifiable at first. Only when the water mirrored a pattern of clouds that appeared in the twilight blue-gray sky above did we begin to see what lay on the other side . . . black Fiji-like mountains lining the other edge of the water, on what we thought must be the Canadian side of the waterway. To this scene, my mind attached tranquil and mysterious scenes of places I’d only read about in books, places where mystics lived and weary seekers traveled en route to their hearts’ desires. It was intoxicating. My partner and I wanted nothing more than to stop along the road, absorb the moment, and stay awhile. But the distracting road, the dwindling daylight, and the ticking clock all made it impossible. I ached to catch the scene on my camera, but the serpentine road offered no safe way to do so, none at least that we could take advantage of in the moment. And honestly, even if she wanted to, this amateur photographer would not have been able to capture near darkness and sheer wonderment on her cheap point-and-shoot camera, no matter how hard she tried. No, instead we gazed to the left as much as possible while darting hyper-vigilant glances at a commanding road. I willed my body to relax so I could capture the view as much as possible with my mind. I knew I would not soon forget it and would someday attempt to write about it and share it. At times, that’s all we can do. Be absolutely present in the moment. Tune ourselves into the layers upon layers of mind-boggling detail nature has to offer. Absorb, remember, and share our stories of the incredible beauty that surrounds us every day. It was not until the next day that we figured out what this enchanting waterway was . . . it was NOT the Strait of Juan de Fuca and our view was not Canada. Instead, we were riding along lovely and enchanting Lake Crescent. I searched and searched through images on the internet, but could not find any that captured what we saw that evening. Here, instead, is a picture I’ve doctored up from the internet that is far less striking and, frankly, pales in comparison in every way imaginable. Trust me, the one in my mind is a zillion times more amazing. What: Breathtaking drive along Lake Crescent in Washington State, U.S.A. 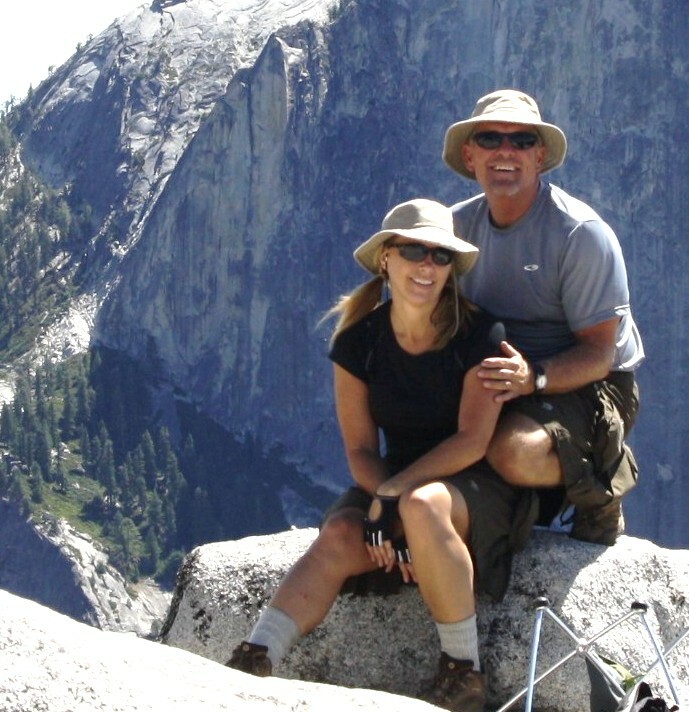 When: We did the drive as part of our 3-Week Teardrop Trailer Trip in late August and early September 2014. Why: You must experience this gorgeous drive at dusk and then spend a day exploring a hiking trail that promises to be quite stunning on the other (non-highway) side of the lake. 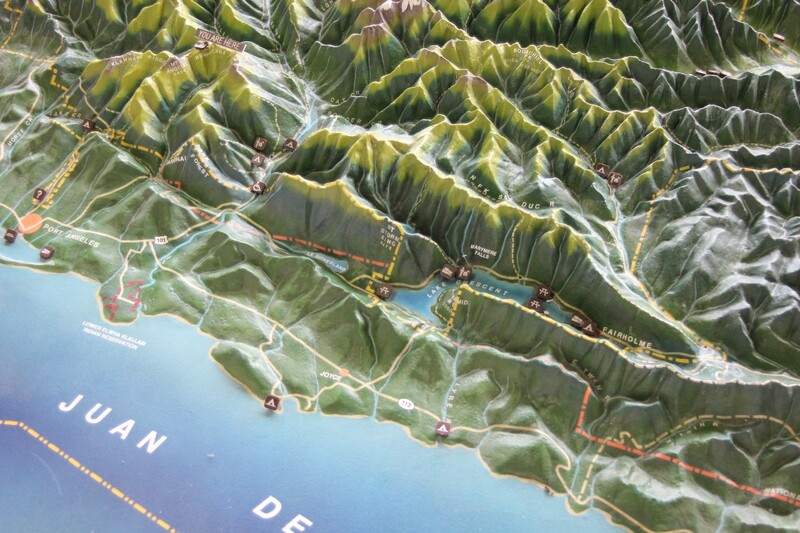 We didn’t get to hike when we went, but will be back again to Lake Crescent to do so in the future. How: Motor vehicle only. The road is too narrow and too curvy to hike, bicycle, or horse ride. It would be far too dangerous for anything other than motor vehicles. 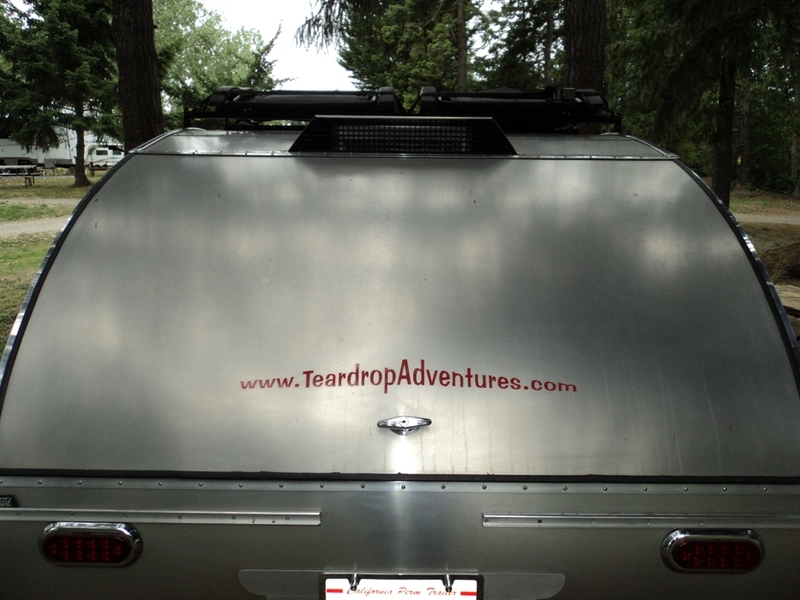 If you want to get timely updates of the posts we’re sharing here on Teardrop Adventures, use the FOLLOW button(s) on this website to enter your email and you’ll get updates directly to your email box. It’s a safe and secure environment, and we promise not to sell your email address to the underground mob in exchange for the dark chocolate we crave. Really. Promise. No, really.